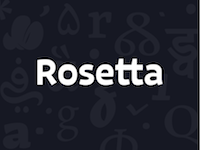 Rosetta was launched in 2011 when designers from around the world came together in the pursuit of a common goal: to create excellent typefaces that would work seamlessly across the world’s writing systems. Headquartered in Brno, Czech Republic, the foundry is made up primarily of designers David Březina, Titus Nemeth, Anna Giedryś, Ben Mitchell and Sláva Jevčinová. The group made their MyFonts debut in November of 2011 with Aisha, a typeface that was listed as a TDC2 winner in 2010. Since then, they have continued to produce high quality type families such as Skolar, a robust, energetic text typeface that was honored with a European Design Award and Granshan Award, and was listed among I Love Typography favorites and as a Modern Cyrillic, Paratype pick; and Eskorte, which also won both a European Design and Granshan Award, and was nominated for a German Design Award in 2015 and was named one of Typographica’s Favorite Typefaces of 2013. The typefaces that they sell through MyFonts support multiple writing systems including Latin, Cyrillic, Greek, and Armenian fonts, but their library as a whole also supports Arabic, Devanagari, Gujarati, and Inuktitut or Cherokee. The foundry works diligently to ensure that each of their typefaces not only support each writing system individually, but that they also work together flawlessly, making the life of any designer dealing with multiple scripts much easier.